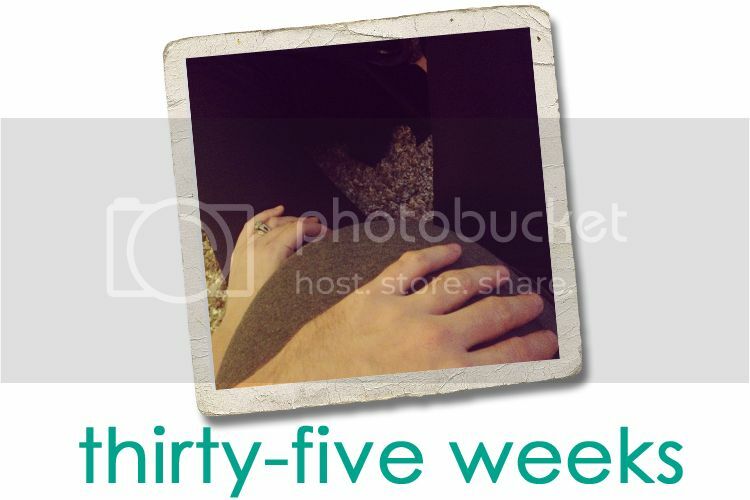 Jordy Liz Blogs: Thirty-five weeks. Things are starting to get done around here. We are checking items off the list almost every night as we get everything in order for your arrival. It feels good to see empty boxes go out the door and clean clothes hanging in your closet. We have diapers out and ready on the dresser, and the last piece of furniture, the glider, is set to arrive at our doorstep this week. Our nights have also started to calm down. We've purposefully left most of our nights open over the next few weeks and we're enjoying downtime. We spend the evenings catching up on recorded shows, getting the house ready for you, and relishing in the lack of busy that overwhelmed us the last few months. This was the first week where the doctor checked to see just how far you're progressing. You're measuring 38 weeks; you are consistently measuring big and I can feel just how big you're growing. I am also one to two centimeters dilated and you are very much head down. While this means things are progressing just how they should be, it also makes me realize just how soon we could be meeting you. I'm nervous and excited at the same time. Things are speeding up and we're in the final countdown. I'm already looking forward to next week's appointment and am so glad I get to check in with you each week from here until your birthday. We can't wait to celebrate you. Please leave your email so I can respond directly to your comment! I read each one and your words are much appreciated. All text and images copyright to Jordy Liz Blogs, 2007-2014. Powered by Blogger.